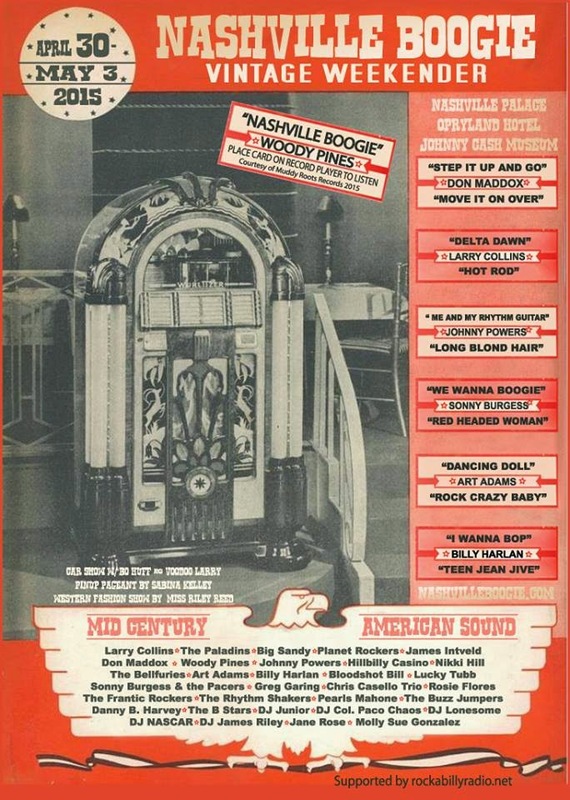 Nashville Boogie Vintage Weekender is the theme this week. All the artists heard on the show will be performing at the event, April 30-May 3rd! You'll hear classic and modern artists like Maddox Brothers & Rose, Johnny Powers, Sonny Burgess, Collins Kids, Rosie Flores, Nikki Hill, The BellFuries, The Paladins, Danny B. Harvey, Planet Rockers, Big Sandy and so much more!! Jason Galaz from Nashville Boogie and Muddy Roots will be joining us in the program as well. Don't miss it!! Nikki Hill- "I've Got A Man"
Big Sandy & His Fly Rite Boys- "Love Debut"
Johnny Powers- "Long Blond Hair"
Sonny Burgess- "We Wanna Boogie"
The BellFuries- "Gonna Make It Alone"
Chris Casello Trio- "Big Big Hole"
Danny B. Harvey- "Get So Excited"
James Intveld- "Doin' Time For Being Young"
Hillbilly Casino- "Come On Camille"
Maddox Brothers & Rose- "Love Is Strange"
Collins Kids- "Hop Skip & Jump"
Planet Rockers- "Long Gone Daddy"
Molly Sue Gonzalez- "Save Me"